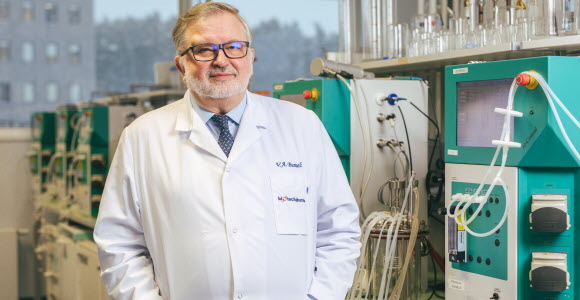 Vladas A. Bumelis is a chemist, biotechnologist and founder of a group of several different companies. Biotechpharma was established in 2004 as a unit for basic biotechnology research. Parallel with this he built up Baltic Medical Centre, a chain of medical clinics. This has grown to become a successful and profitable business. Five years ago he decided to take a more active role in Biotechpharma, which took on a new direction with contract manufacturing for the pharmaceutical industry. The company established a modern research and production facility, and since 2013 it has grown from some 30 customers to around 150 today, primarily in the USA, Europe and Asia. The company has 150 employees, and the company group as a whole employs some 500 people. As an entrepreneur, Vladas has a long-standing relationship with SEB, which has been by his side and supported him with financing and other services through his journey of growth. Since biopharmaceutical development requires extensive investment, the bank’s lending has been supported by thorough analyses and reviews of the company’s business plans. “This requires mutual trust – we must understand and have confidence in each other,” says Vladas. “Since I had built up a successful and profitable medical clinics business, the bank was prepared to listen when we laid out our plans for Biotechpharma,” he says. Vladas A. Bumelis appreciates this long-term relationship, and when SEB launched a private banking offering in Lithuania he left his previous Swiss bank and also moved his private banking business to SEB. “We must always strive to deliver excellent quality. And that’s how SEB works for me,” he insists.